Models of wide skirts from the 60th years of the last century again at popularity peak. Womanly skirts sun in which our mothers and grandmothers, among the main favourites of this year flaunted. 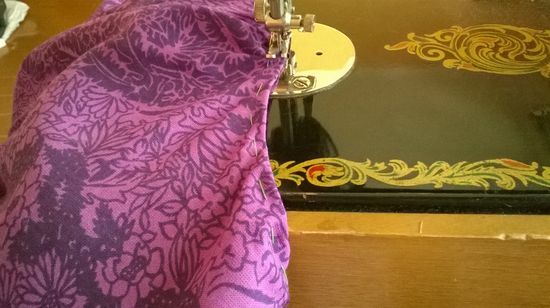 We suggest you to arm with a stylish bagatelle and to sew a fashionable skirt sun in house conditions. 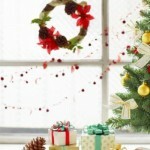 Only two measures will be necessary for creation of a pattern of this model: grasp of a waist and length of a product. Choose fabric easy and "flying" which will be able to open lightness and smoothness of lines of model in all beauty. For example, perfectly will be suitable for a summer skirt sun: silk, atlas, velveteen, dense cotton. Let's begin with creation of the drawing of a pattern. For this purpose on a big sheet of paper it is necessary to draw a right angle with top in a point of the Lake. If a leaf equal, a corner it is possible not to draw, and it is simple to take for a point About its top right corner. 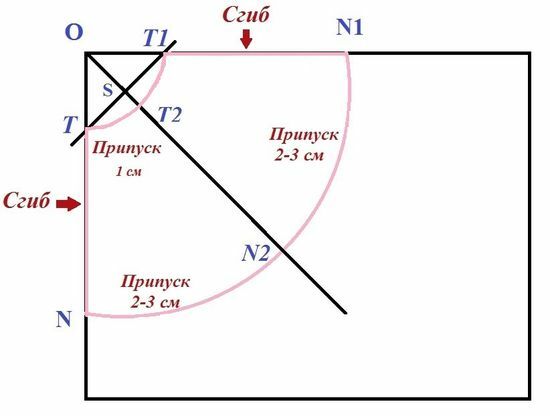 Now it is necessary to calculate length of pieces of OT and OT1. It is possible to make it, having divided a waist grasp on 2π (π ≅ 3,14). To the turned-out figure it is necessary to add 1,5 cm and to postpone this distance from a point About in both parties. Farther points of T and T1 need to be connected a straight line, to find the middle of this piece (S point) and to draw through it one more straight line. On this line it is necessary to postpone a piece OT2 equal to OT and OT1. And points of T are farther, T1 and T2 needs to be connected an arch. Now from points of T, T1 and T2 on lines on which they are located, it is necessary to postpone length equal to product length. That is pieces of TN, T1N1 and T2N2 are equal to skirt length. And then points of N, N1 and N2 it is necessary to connect among themselves an arch. If it is impossible to make it exactly, it is necessary to draw additional lines from a point About and to postpone for them product length from TT1T2 arch. 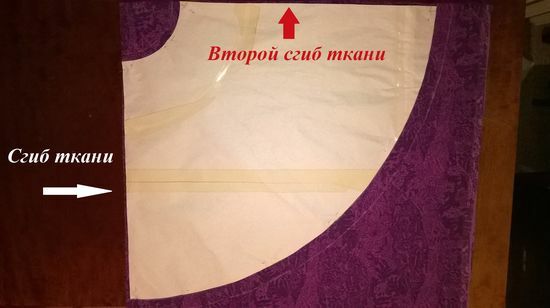 On it the drawing of a pattern is ready, it is necessary only to cut out it on those lines which are designated in the pink color in drawing. 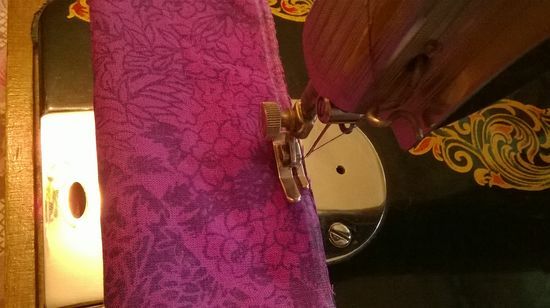 Now fabric it is necessary to iron, put it four times and to fix on it a pattern safety pins. 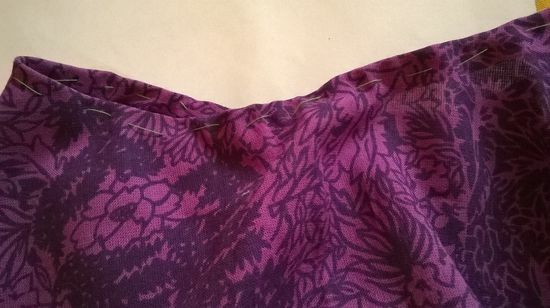 The pattern needs to be led round both on a contour, and taking into account allowances for processing of cuts of fabric. 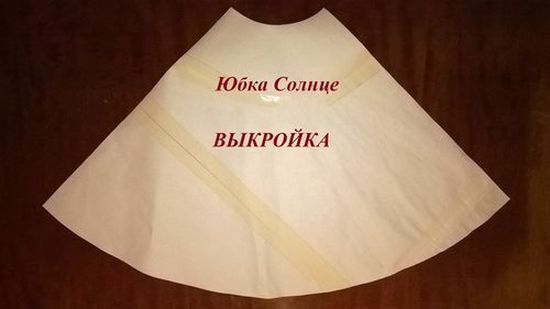 An allowance on a waistline of 1 cm, on a skirt bottom - 2–3 cm. 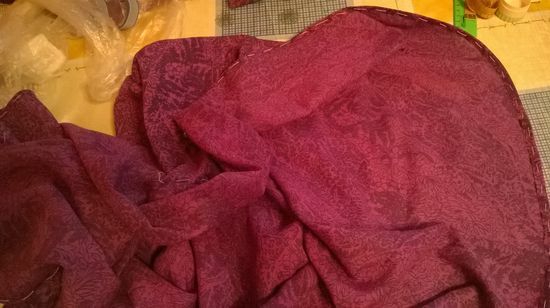 It is necessary to cut out fabric on lines of allowances, scissors thus always have to concern a table and stand perpendicular to fabric. Now it is possible to start processing of a waistline. For this purpose we do a subcollar inside and we sweep off it. Prostrachivayem of subgate on the machine. 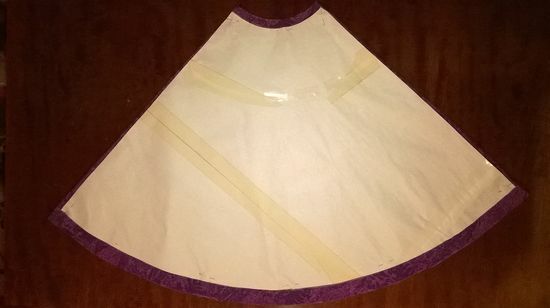 Bottom at this skirt very big and it is exactly difficult to hem it. Therefore at first it is necessary to make and tack one subgate. And then to sprain it once again, prostrachivy on the machine. 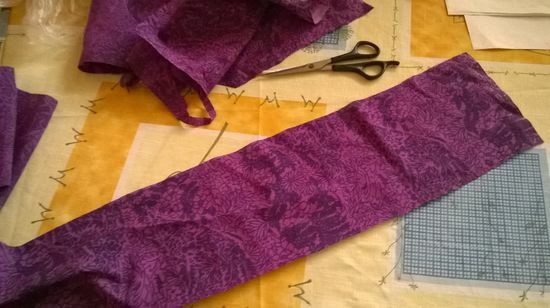 Now it is necessary to cut out a strip for a belt from the remained fabric. Its width has to be equal to a half of width of a ready belt plus 2 cm on allowances. 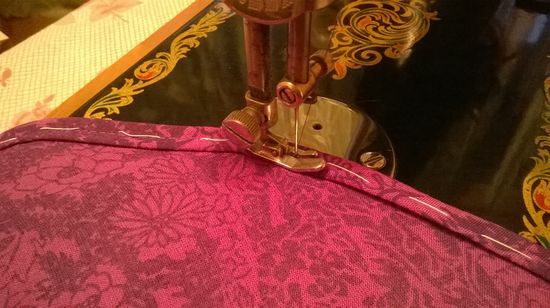 And length has to correspond to cut for a waist on a skirt after processing of a seam plus 2 cm on allowances. 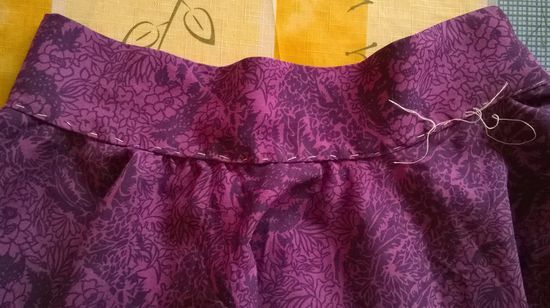 Then the belt needs to be stitched from seamy side at distance 1 cm from fabric cuts. And then to turn out it on the face and to iron the iron. 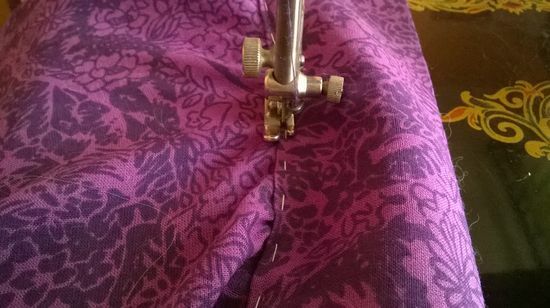 Further to tack to a skirt from the face and to pristrochit on the machine. 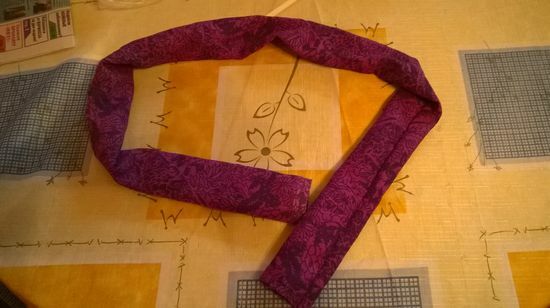 Then to insert into it an elastic band of the necessary width, to sew its ends, to sew up the ends of a belt with an overlap with a subcollar inside. 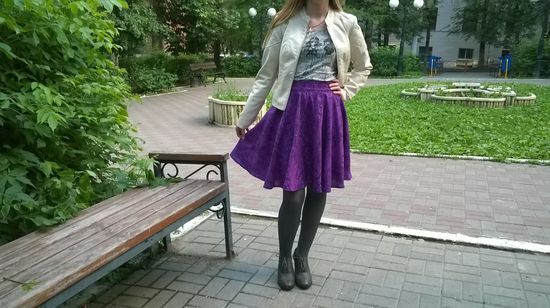 The skirt sun - is ready!